Ah, two days Off Grid. And I know that I’m grossly misusing the term “off grid” here, but it sounds exciting and dramatic and you all know how I love a bit of over-dramatisation. What I mean to say, really, is 2 Days Away on Holiday, but online reviews of The Scarlet Hotel promised patchy WiFi and non-existent phone signal and so I proudly told people (about three of them – it was on a need-to-know basis) that Mr AMR and I were going “off grid”. 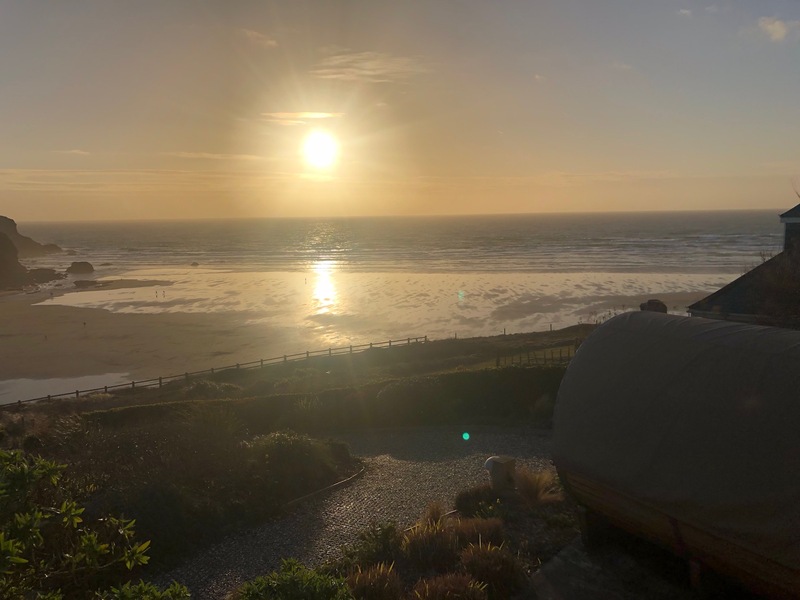 As though we were travelling to the middle of the Australian Outback to lie under the stars on a piece of tarpaulin and not merely driving down to Cornwall to slosh about in a trendy wooden hot tub and drink biodynamic wine. As it turned out, the WiFi at The Scarlet was actually rather speedy and, for some unknown reason, I seemed to have better phone signal than I get at home, so I was completely contactable and probably wasted more time on Instagram Stories stalking people I’ve never met than I would if I wasn’t on a self-imposed digital ban. 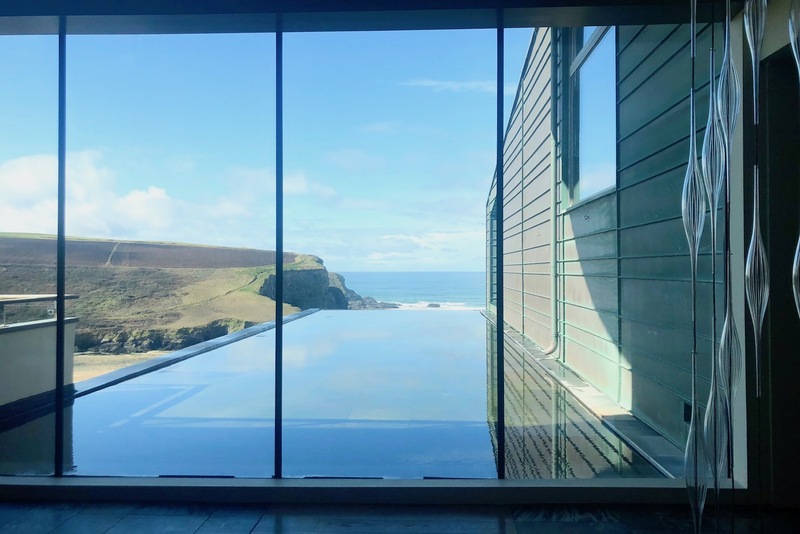 But I digress; I wanted to write a quick review of The Scarlet hotel in Cornwall because it’s the first time that Mr AMR and I have been away together, alone (I think? ), since we had Baby Ted. So quite momentous, really – no children (they’re not allowed at The Scarlet, hurrah! ), no dog (these are allowed, but a break from him lying on my legs at night was welcomed) and no stressful work talk. Except that all I do is stress and talk about work and my huge, outrageously unrealistic plans for the future. 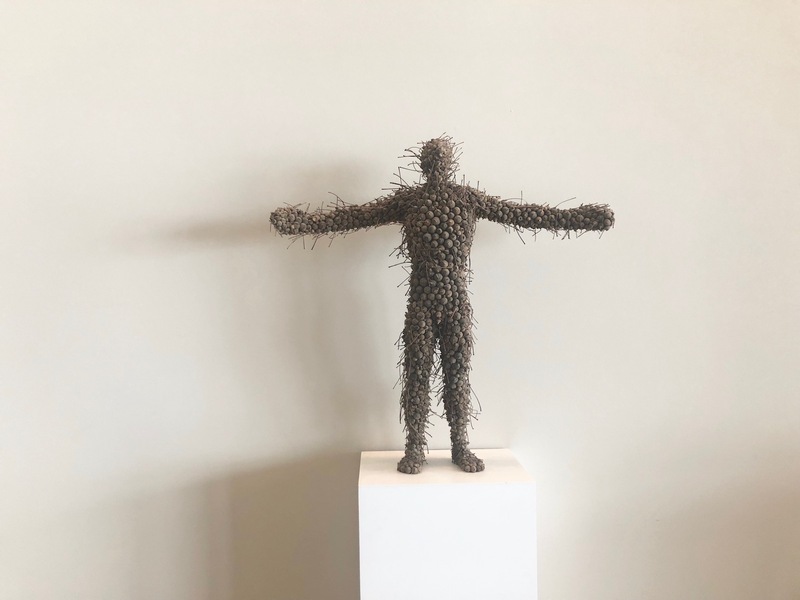 Poor Mr AMR – he has to listen to me moan about tiredness and “being at the end of my tether” for one half of the time and try to be enthusiastic about my crazy goals for the other. 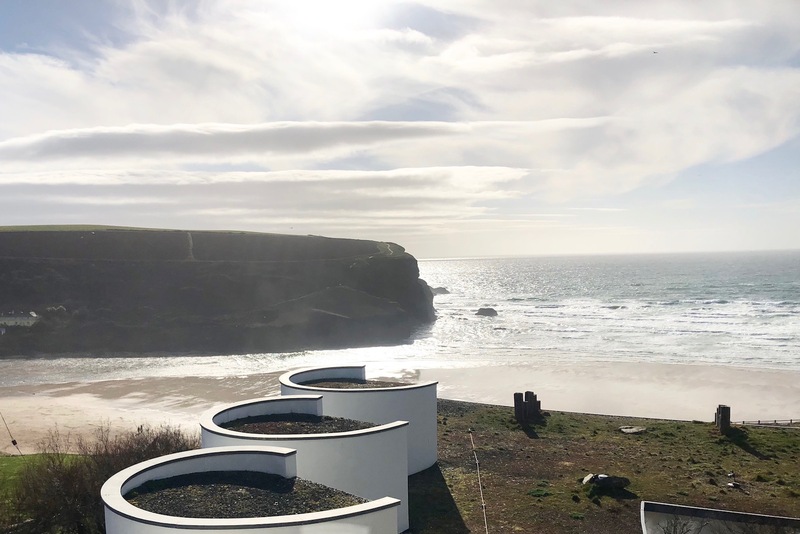 Well The Scarlet happens to be both on a rugged cliff and also modern with amazing sea views – double whammy hotel bingo. Add to the stupendous scenery an excellent-yet-informal restaurant, quiet, eco-friendly rooms and a spa that is like a giant cocoon and you have the sort of place you feel instantly at home in. There’s no concierge or reception desk (staff see you come in and then come out to greet you), people are milling about in dressing gowns and the crazy elf slippers provided in the rooms, and the whole hotel is warm. Not stuffy, overheated, but just…warm. As though the sun has been on it all day, except when we arrived it wasn’t even remotely sunny. Because I was on a strict no-work ban, I didn’t really take many photos – I think that you can go and look yourselves if you want to see what the rooms are like (see here*) – but I couldn’t resist capturing the view from our room. It was like being in a film! 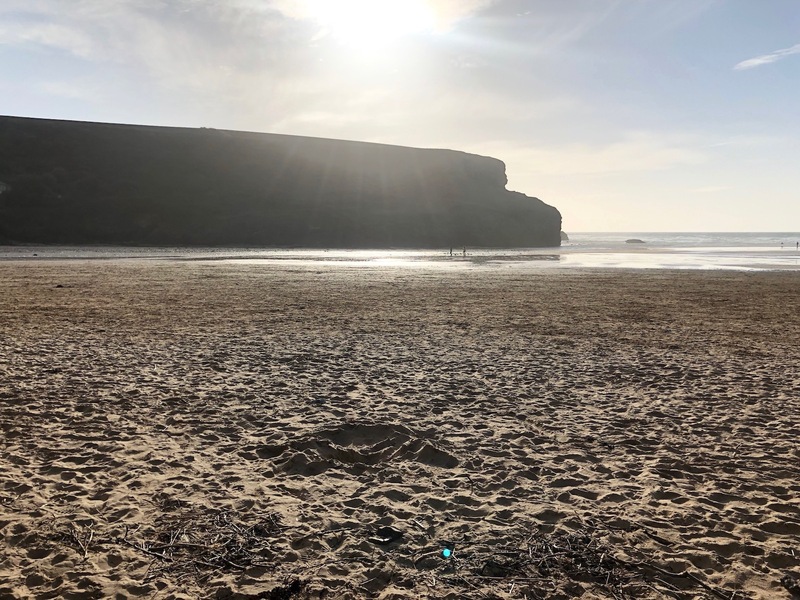 And because the hotel was so warm, we kept our sliding doors open the whole time – even through torrential rain – and listened to the sound of the sea roaring up the cliffs. It was just so, so relaxing. 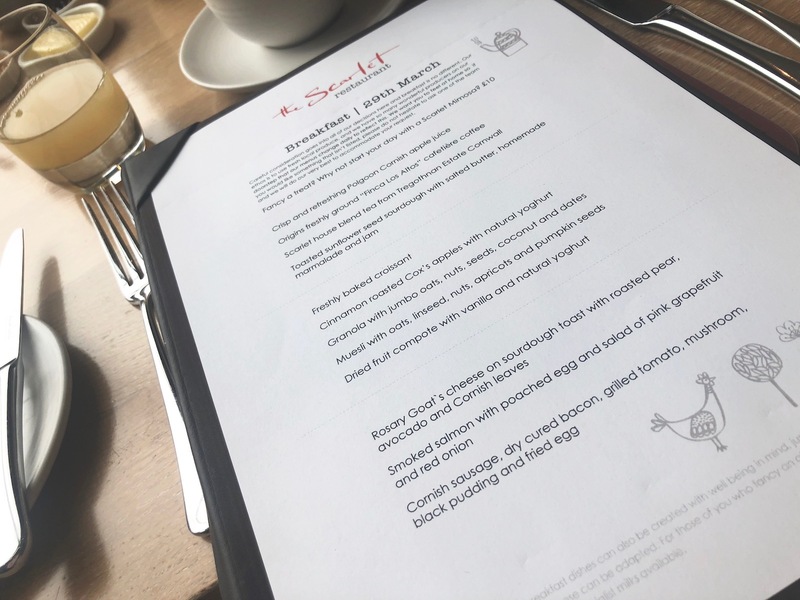 The food was brilliant – I had a dhal on one night, something meaty on the other, both times followed by the cheeseboard which was exemplary – and the breakfast was a far cry from your usual buffet set-up. There was actually a menu with courses – no croissant piled up with some cheese slices and a bit of fruit salad bunged on the side, this was proper feasting stuff, just tweaked to suit early morning appetites. I had the most amazing ewe’s cheese with thinly sliced pear as a “starter” on one morning, some fabulous pancakes as a “main” the next. This was supposed to be a quick review – I’m afraid my work ban meant that I didn’t write down my usual meticulous notes – and so I shall let you read more about The Scarlet here* if you feel tempted, but it would be remiss of me to finish without mentioning the cool styling, Ligne Roset furniture and (purchasable) modern art dotted about the hotel. Oh – and the hot tub. Amazing. Right on the cliff, overlooking Mawgan Porth below, the sound of the crashing waves and little dogs yelping as they run in and out of the surf. 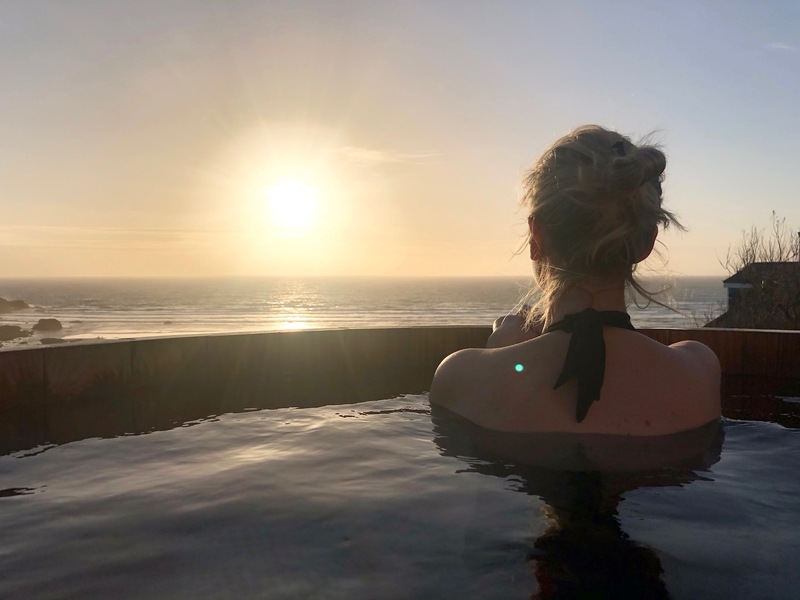 We were lucky enough to have our hot tub session as the sun went down and it was nothing short of idyllic – one of those moments when you just feel in awe of how beautiful the world is and everything seems positive and optimistic and brilliant. You can book The Scarlet through Mr & Mrs Smith here* (I’m a big fan of Smith, as you know!) which means you get a little gift. The Scarlet’s own website is here and you can find all of Pai’s wonderful skincare products online here.